South Dakota is famous for the scenic wonders of the Badlands, the Black Hills, and, of course, Mt. Rushmore. Prairie, grassland, and farmland cover 90% of the state, where buffalo once ranged in herds of thousands. Dynamic historical figures like Lewis and Clark, Wild Bill Hickok, Calamity Jane, Sitting Bull, and General George Custer have all added to the colorful past of South Dakota. When Custer's military band found gold in the Black Hills in 1874, word of the discovery reached back east to Chicago, and the Gold Rush followed. By 1876, prospecting towns like Dead Tree Gulch exploded with fortune seekers lured by the glitter of gold. Before it closed in 2002, South Dakota's Homestake Mine was the oldest, largest, and deepest mine in the western hemisphere and one of the largest gold producers in the United States. To find out more about the Homestake Mine, you can visit the Homestake Visitor Center, on West Main Street in Lead, South Dakota. North and South Dakota were one territory until 1889. Dakota was named for the Dakota, Sioux tribe which lived in the region. Dakota is the Sioux word for "friends" or "allies." South Dakota has been promoted as "The Sunshine State" in state publications promoting tourism because of the great percentage of sunshine that is present during the year. This nickname simply refers to the large coyote population in the state. Coyotes were so numerous in South Dakota that they were adopted as the official state animal in 1949. Coyotes occur in greatest numbers along the Missouri River and its tributaries and in the Black Hills. Another nickname for South Dakota made reference to the large number of artesian wells that were found in the state. The severe winter weather of South Dakota led to another nickname; The Blizzard State. We don't suppose those who promoted South Dakota as The Sunshine State were too fond of this particular nickname. Texas is also known as "The Blizzard State." South Dakota has also been referred to as "The Land of Plenty" and "The Land of Infinite Variety." When both North and South Dakota are the subject, they are sometimes referred to as The Twin Sisters. People who live in South Dakota or who come from South Dakota are called South Dakotans. The fifth and final commemorative quarter-dollar coin released in 2006 honors South Dakota, the "Mount Rushmore State," and is the 40th coin in the United States Mint's 50 State Quarters® Program. Admitted into the Union on November 2, 1889, South Dakota became the Nation's 40th state. The release of this quarter signals the end of the eighth year of the 50 State Quarters Program. The South Dakota quarter features an image of the state bird, a Chinese ring-necked pheasant, in flight above a depiction of the Mount Rushmore National Monument, featuring the faces of four American Presidents: George Washington, Thomas Jefferson, Theodore Roosevelt and Abraham Lincoln. The design is bordered by heads of wheat. The coin's design also bears the inscriptions "South Dakota" and "1889." Sculptor Gutzon Borglum began drilling into Mount Rushmore, the 5,725-foot peak rising above Harney National Forest, in 1927. Creation of the "Shrine of Democracy" took 14 years and cost approximately $1 million, though it is now deemed priceless. The South Dakota Quarter Advisory Committee began accepting ideas from the citizens of South Dakota via telephone, letters and e-mail. A group of five possible narratives was agreed upon and forwarded to the United States Mint for consideration. The final artistic renderings, developed by the sculptor-engravers of the United States Mint and artists in the United States Mint's Artistic Infusion Program, were returned to South Dakota, and a statewide vote was conducted. 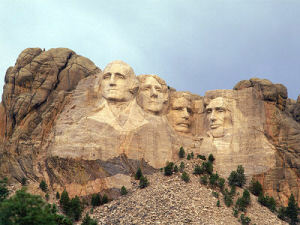 On April 27, 2005, South Dakota Governor M. Michael Rounds announced his recommendation of the "Mount Rushmore and Pheasant" design, echoing the choice of those who participated in the statewide vote. The Department of the Treasury approved the design on May 28, 2005. The other design concepts considered during the final selection process were "Mount Rushmore National Monument," featuring a three-quarter view of the famous mountain carving; "American Bison," depicting the classic animal symbol of the west; "Chinese Ring-necked Pheasant," featuring an image of the state bird in flight; and "Mount Rushmore and Bison," which placed an American bison in the foreground and Mount Rushmore in the background. South Dakota (From Sea to Shining Sea) , by Caryn Yacowitz. 80 pages. Publisher: Scholastic Library Publishing (September 2003) Reading level: Grades 3-5. Presents information about South Dakota's people, geography, history, landmarks, natural resources, government, state capitol, towns and cities, and more. South Dakota (World Almanac Library of the States) , by Kris Hirschmann. 48 pages. Gareth Stevens Publishing (February 2003) Reading level: Grades 4-6. Filled with the most up-to-date information, including the latest Census results. Full-color photos bring to life the story of South Dakota. In addition to an in-depth factual profile of South Dakota in the form of a state Almanac, this book offers fascinating and lively discussions of the state's history, people, geography, government, economy, culture, and lifestyles. A section on Notable People, a calendar of events, and enough primary source documents, time lines, maps, and other tools to make this unquestionably the best young adult reference material on the USA available anywhere. History Of South Dakota , by Herbert S. Schell & John E. Miller. 443 pages. Publisher: South Dakota State Historical Society Press; 4 Revised edition (August 23, 2004) The classic history of the state. History of South Dakota is widely recognized as the definitive history of the state. Beginning with the earliest American Indian settlers, Herbert S. Schell traces the history of this region midway between the Midwest and the West. This classic account provides a picture of South Dakota's political, economic, social, and environmental history, identifying the local, regional, national, and global forces that shaped the fortieth state through World War II. John E. Miller picks up the story at the beginning of the Cold War and chronicles the rest of the twentieth century. From the interaction of its native inhabitants with its newer visitors and residents, including fur traders, gold miners, homesteaders, and cattlemen, to the development of its political systems, the state's rich heritage is captured here. By placing the opportunities and challenges of the last century--rural electrification, interstate highways, agricultural consolidation, ongoing dialogues among American Indians and non-Indians--in context, Miller contends that the state's citizens will be better able to forge its future in the new millennium. A New South Dakota History , Edited by Dr. Harry F. Thompson. 650 pages. Publisher: Center for Western Studies: Augustana College (April 30, 2005) This is a new story of South Dakota's past--a fresh telling of South Dakota's always interesting, often colorful, and yet sometimes painful history. The first full-scale interpretation of the state's history in more than forty years. A New South Dakota History emphasizes the geographic and cultural diversity of the nation's fortieth state. Acknowledging rather than igonoring the problems of the past, this history offers new and varied perspectives on the state and, in so doing, provides a foundation for a better understanding of the issues facing South Dakota now and in the near future. This history also celebrates the achievements of the state in such areas as agriculture, urbanization, communications, tourism, and the arts. Featuring essays by nationally recognized authors as well as full-length chapters by noted scholars, this 650-page history is intended for general readers, college students, and teachers of South Dakota history. 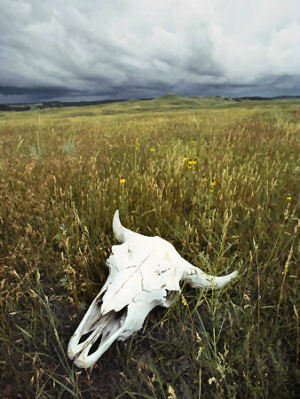 Roadside History of South Dakota , by Linda Hasselstrom. 480 pages. Publisher: Mountain Pr; 1st edition (May 1, 1994) This roadside history helps readers appreciate the roles that fur traders, homesteaders, politicians, ranchers, farmers, and even prairie artists have played in South Dakota's history. Reading Roadside History of South Dakota is like having a friend guide you through the state's rich past and wide-open spaces, from its homespun beginnings to its endurance as one of the nation's most rural states.